I know I promised this last week, but things got a little crazy busy so I’m sorry this is coming to you late. 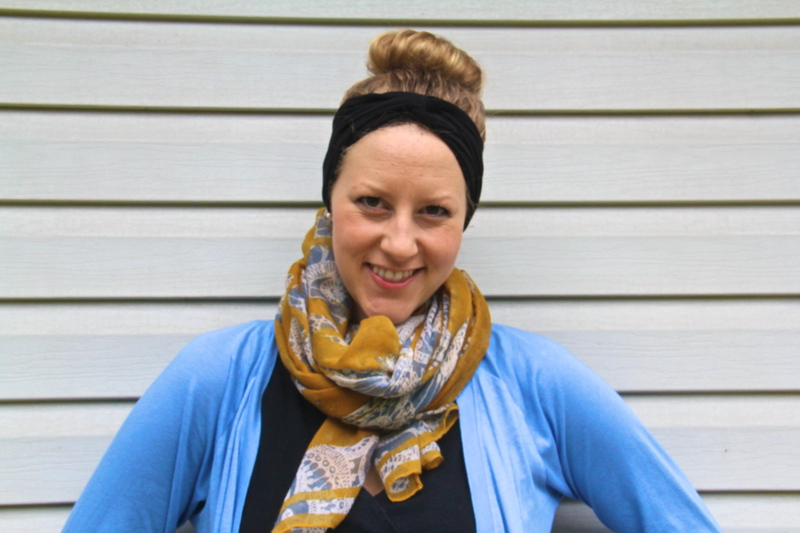 Since making this headband I have sported it about 3 times either hair up or hair down. 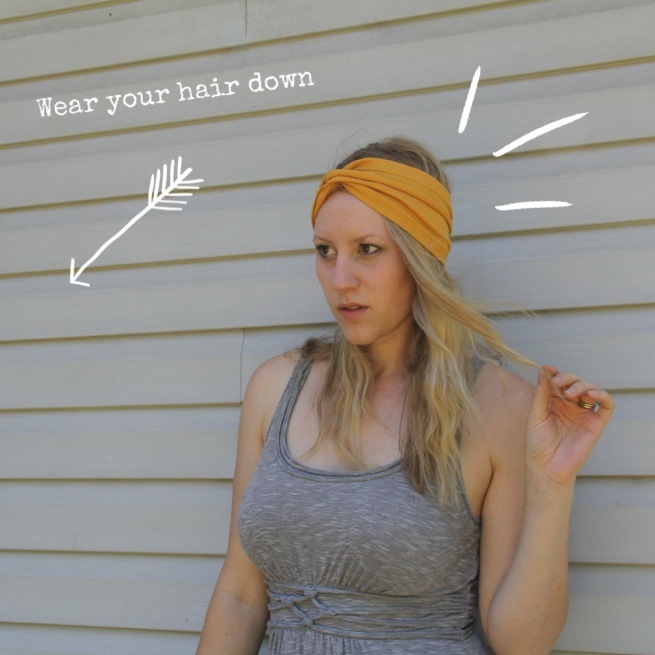 That’s one nice thing about this headband- versatile! 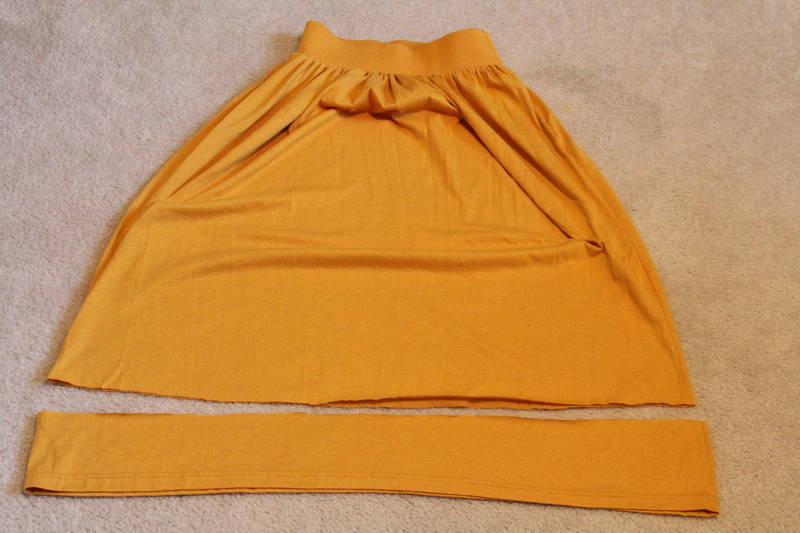 I ended up making a few colors because I had some old dresses/skirts that were just laying around. 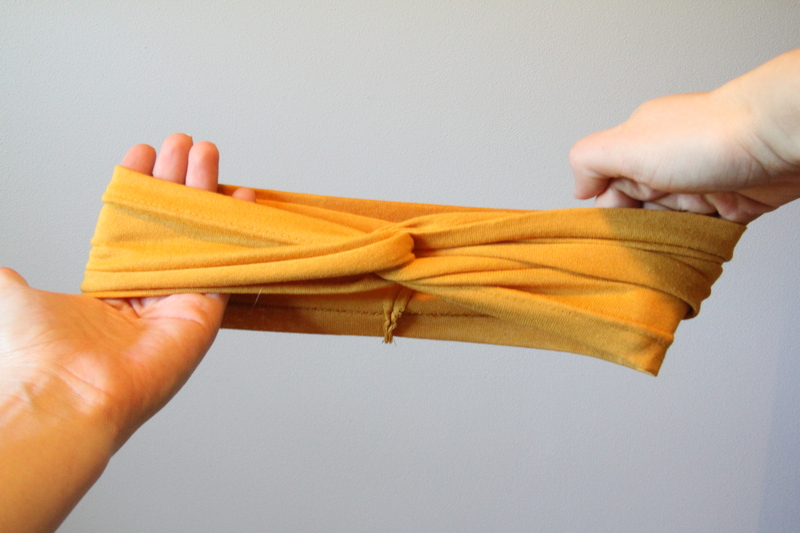 You’ll want to use a fabric with a little bit of stretch in it if you can. I used a jersey knit for both of mine and they have held up great. 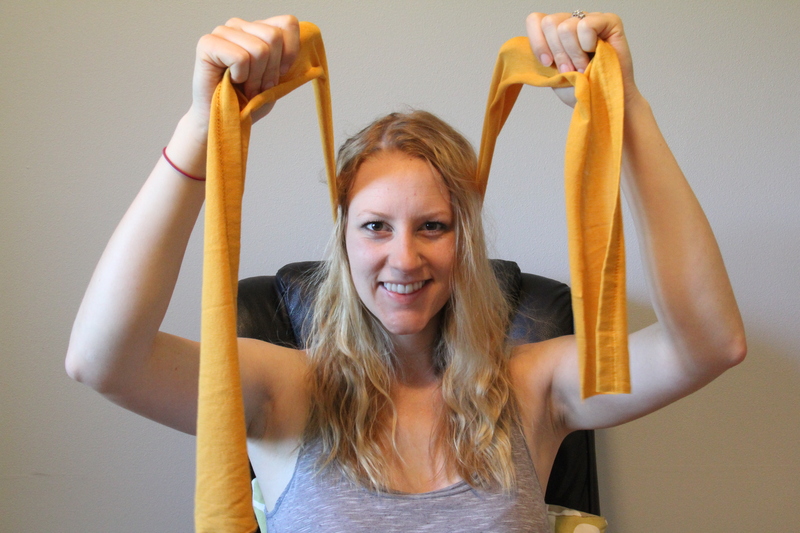 Literally all you will need is some fabric of your choice, thread and a sewing machine. 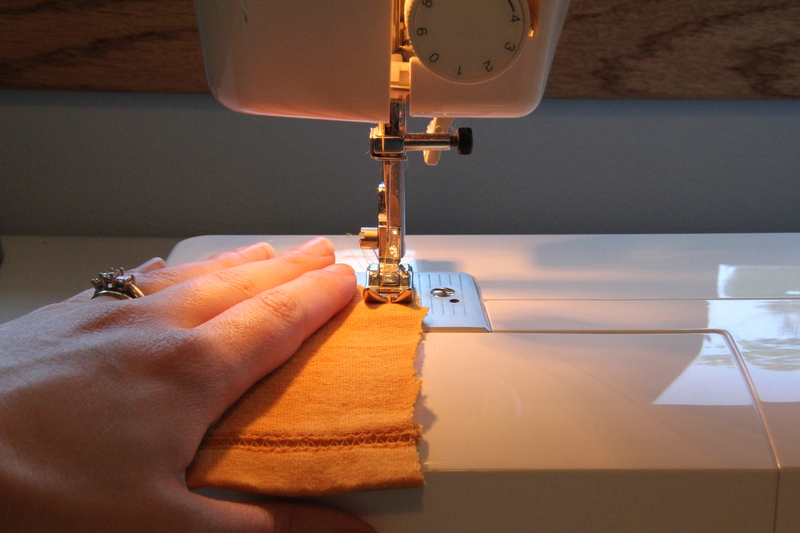 You also have the option to hand sew if you don’t own a sewing machine. 1. 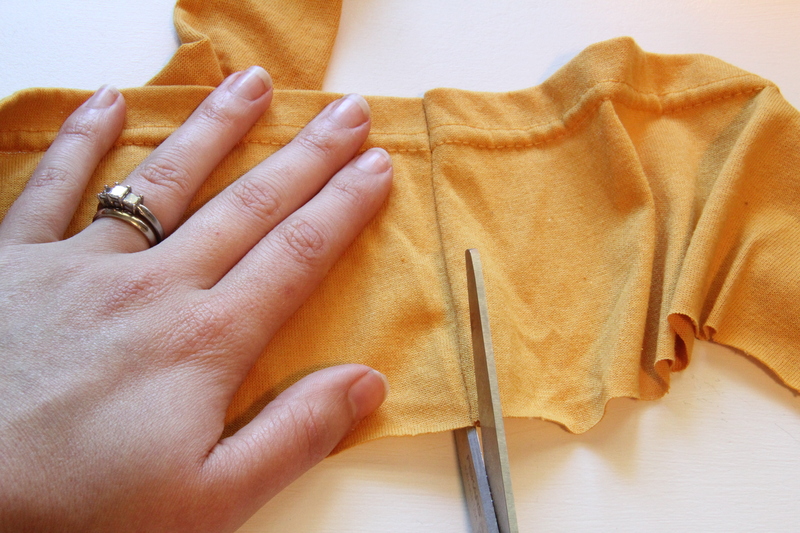 Take your fabric and cut the desired width. I chose to do 4 inches wide, which worked very well for coverage on my head. If you are making this for a baby/child you may want to make the width smaller to accommodate their head size. Again, I used an old skirt I had laying around and just cut off the bottom! 2. 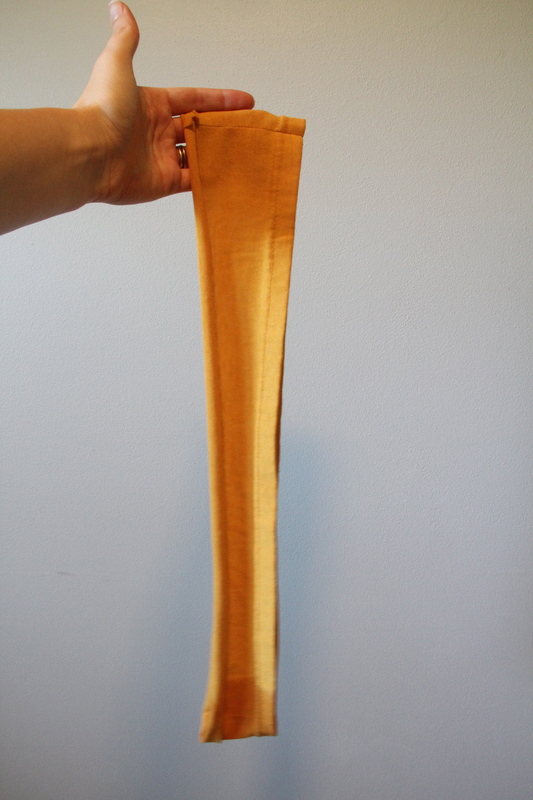 If using an existing seamed item, cut the existing seam so you have one long piece of fabric. 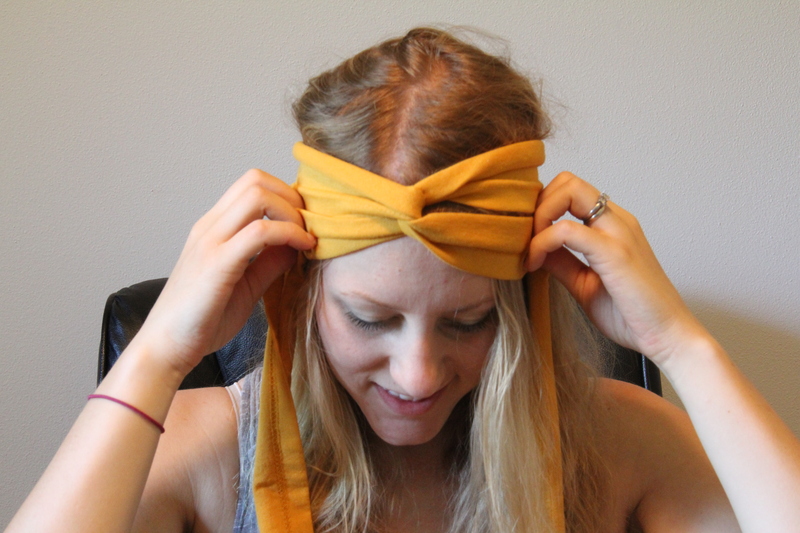 You will be making our own seam so you don’t want multiple seams for your headband. 3. Place the material around the back of the head where you will be wearing it when it’s finished. 4. Take and cross the material in front of your head. Then AGAIN cross it to create the little twist in front. Cute huh?! 5. 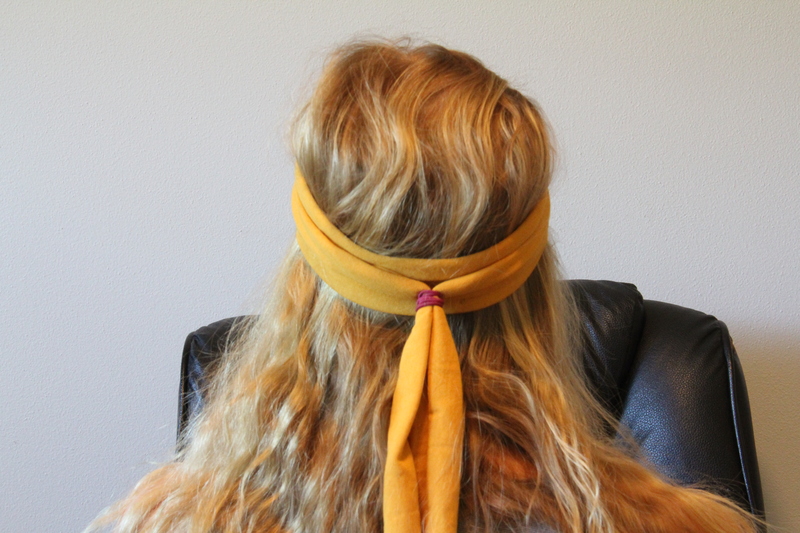 Pull the ends toward the back of your head again and secure it with a hair tie. 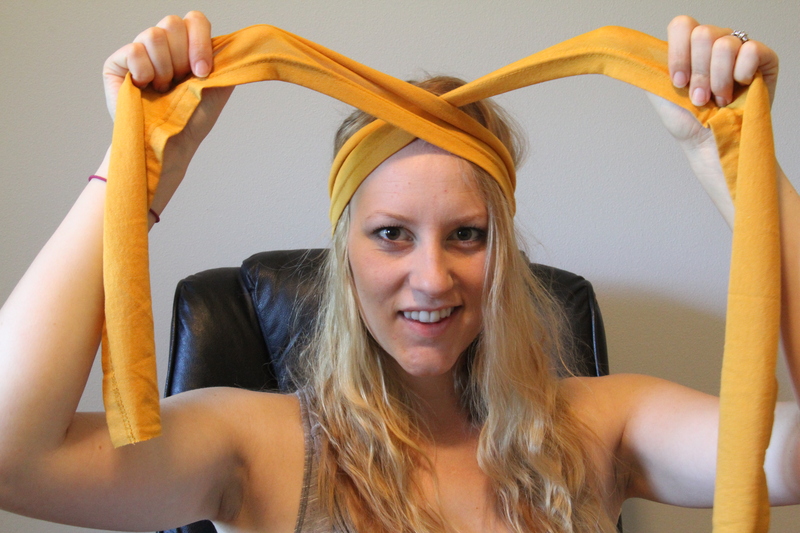 This is how you make sure you have the right fit for your headband. 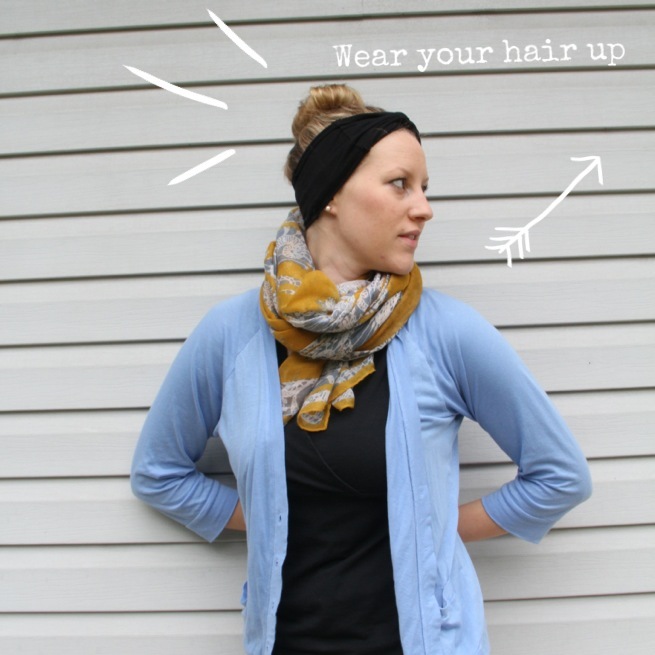 Next, Take the entire piece off your head with the hair tie still in tact so you don’t lose your desired fit. 6. 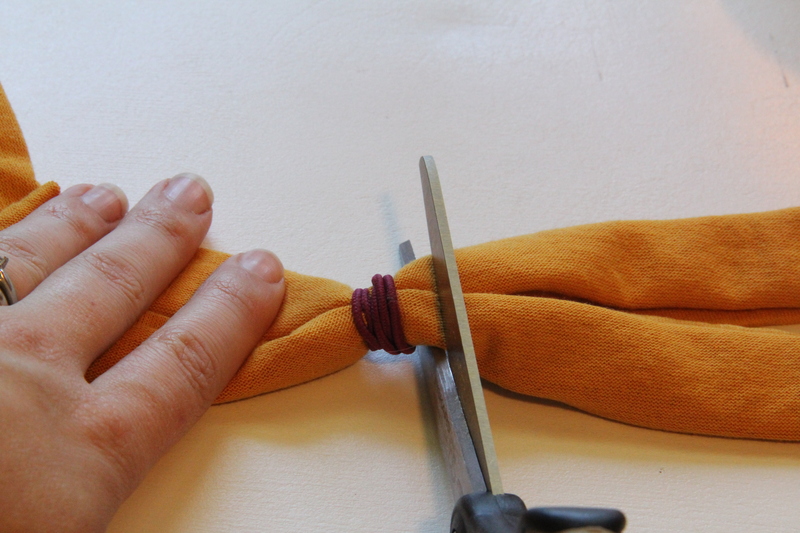 Cut off the excess fabric on the other side of the hair tie. 7. 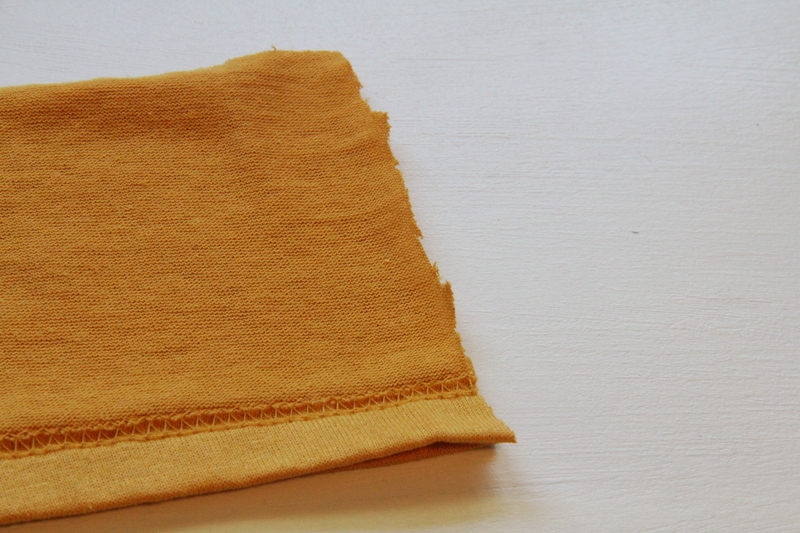 Unloop your fabric so it’s laid flat- the good sides should be facing each other and the bad sides of the fabric are facing out like shown above. 8. 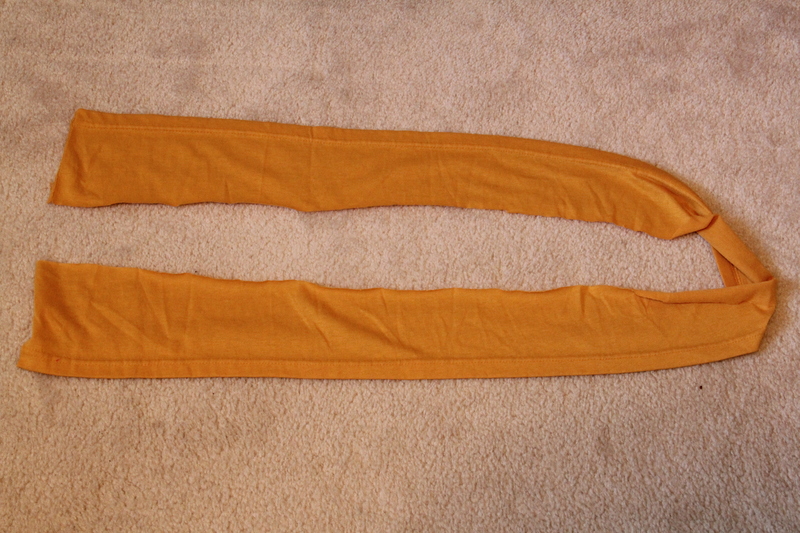 Now just sew a seam from the top of the band to the bottom. 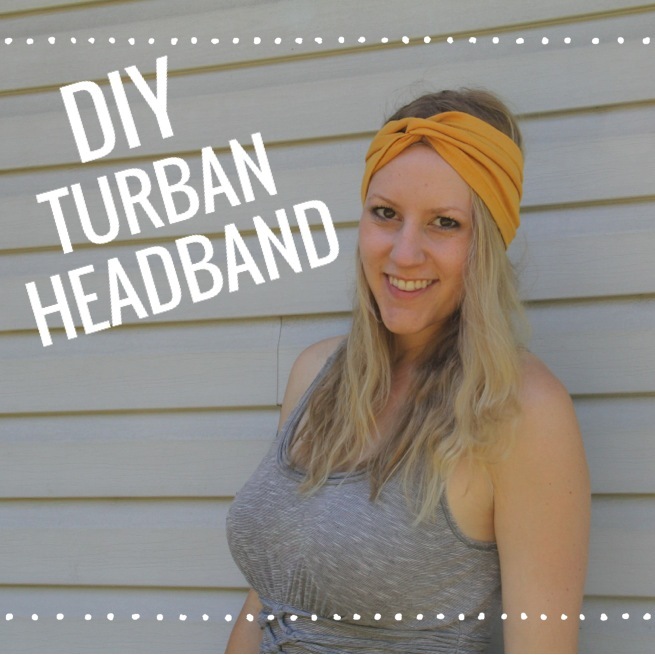 Don’t worry if your cut isn’t perfect because that will go on the inside of your headband and won’t show. 9. You now have made a continuous loop and are ready to twist it into shape. 10. 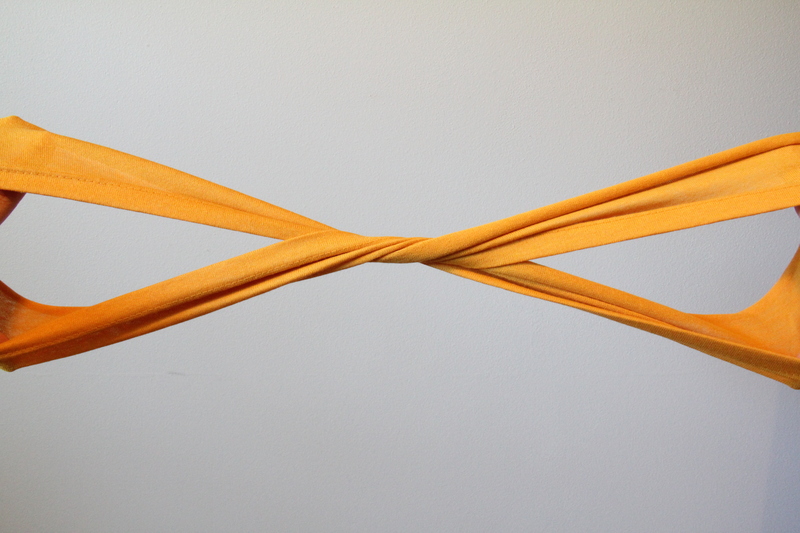 Take the loop in both hands and twist it once. And then one more time. 11. Place one end inside the other so the back part lays nice and flat and together. Don’t worry it took a few times to get used to it, but practice makes perfect so don’t give up! Now it’s time to show the world your trendy, crafty skills. Wear it with pride! I bet you can’t just make one! Enjoy you fashionista! What do you use to keep writing on your photos? Is that a phone app? Looks great with that dress! This is the exact tutorial I have been looking for !! Thank you.. Can’t wait to make one! !